A famous daily newspaper has a popular Sunday supplement called, “News of the Week in Review.” Tragic natural disasters have been multiplying at such a horrible rate that the newspaper could easily publish another Sunday section called “Disasters of the Week in Review.” Violent earthquakes, deadly tornados, tsunamis and extraordinary flooding have been dominating the news for months. So great and numerous have these tragedies been that we must ask ourselves whether they are they just a result of blind natural forces (Mother Nature as the media like to put it) or should we seek another factor at play here. In the not too distant past, Catholics gave some thought to the fact that God frequently intervenes in our lives, either to provide assistance or to exercise just punishment. These Catholics of a certain vintage are guided by the concept of Divine Providence, although modern society after decades of being immersed in materialism may find that rather quaint. Central to this concept is that God knows the ends of all creation and the goal of each of His creatures, and most important that His laws govern the universe. Not only does God intervene, but He has inspired several writers to provide a record of that merciful acceptance. Beginning in the middle of the second millennium B.C. at more or less the same time as the invention of alphabetical phonetic writing (which may not be a coincidence) a large body of work has accumulated that we call Sacred Scriptures. The climax occurred when He sent His most beloved Son to earth to suffer an ignominious death to rescue mankind from the penalties incurred by its dreadful behavior. When one of the four asked for an explanation, Christ launched into a lengthy and frightening discourse on universal and Church history from multiple perspectives. He spoke of great tribulations, natural disasters, disease and famine and singled out the Flood of Noah as a poignant illustration of man’s persistent unbelief. Saint Luke in parallel passages in his chapter 17 also introduced lessons from Sodom (v. 29) which added unnatural sinfulness to the causes. Modernists who have a tendency to ridicule the great Deluge should heed Our Lord’s comments on Noe’s contemporaries especially their indifference to the impending danger. “For as in the days before the flood, they were eating and drinking, marrying and giving in marriage, even till that day in which Noe entered into the ark, and they knew not till the flood came, and took them all away” (Matt. 24:38-39). In 1993 two oceanographers, Bill Ryan and Walter Pitman, with connections to Columbia University discovered that the Black Sea was once a freshwater lake some 500’ below its present elevation. Couple this fact with the evidence that at numerous towns along the Tigris-Euphrates River Valley massive flooding took place. We should assemble these facts with the biblical admonitions in mind instead of adjusting them to prove the opposite. Nevertheless Christ’s message in two different Gospel accounts put a divine imprimatur on the story of the Great Deluge and its purpose. As we started this report, the cresting stages of the Mississippi were moving to the southern end of the river. And as we end this first installment, stories are appearing that the flooding in the central river valleys is starting all over again. Torrential rains and meltwater from the winter’s heavy snowfall are flooding the northern end of the Missouri River Basin which eventually will cause more havoc in the Northern Plains. 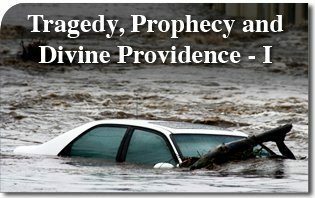 This entry was posted in Catholic Perspective and tagged Christ, Divine, Divine Providence, Jesus, natural disaster, Our Lord, prophecy, Prophecy and Divine Providence, Providence, suffering, tradegy, Tragedy, unnatural sinfulness by Jeremias Wells. Bookmark the permalink.